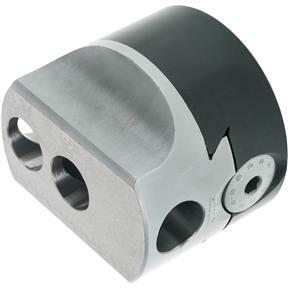 This high quality Boring Head is an excellent performer at an affordable price. Practical design provides maximum rigidity even when boring bar holder is used in an offset position. Hardened and ground adjusting screw along with a wide base design guarantees long life and trouble free use. Features an offset reading dial which moves and reads .040" per revolution of the adjusting screw. Boring head O.D. size is 4", boring bar diameter is 1", maximum offset is 1-5/8" and minimum graduation is 0.001". Includes adjusting wrenches.